The Birdist: Is This Bird ABA Countable? Hi friends. There are complicated rules governing whether a bird you've identified in the American Birding Association area is actually countable on your official life/state/patch/whatever list. 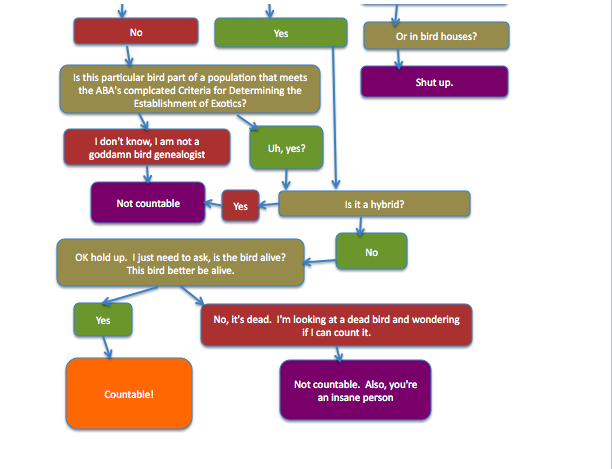 I've made a helpful spreadsheet you can use to determine* whether or not your bird counts. 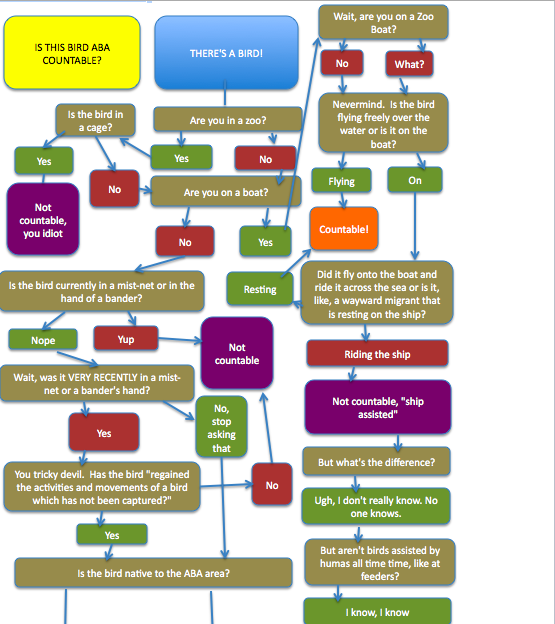 *This is meant for humorous purposes, please work your way through the ABA's rules for countability and exotic populations to determine whether or not you're actually looking at something countable. Labels: ABA, American Birding Association, birding, is this bird countable?, what is this bird? This is so funny! I wish I could see it a bit better. This is hilarious. Very clever and hilarious. I believe that the rules changed some years ago to allow counting of birds that are being banded, provided it is part of a REGULAR banding effort, and all permits are in order. Just FYI, you're incorrect about rules being changed to permit the counting of birds in the hand. The ABA rules still clearly state that a bird needs to have "regained the activities and movements of a bird which has not been captured" to officially count. "Wait, are you on a Zoo Boat?" Love it. Very, very funny. This is awesome. It's nice to see someone taking the whole "countable" thing a little less seriously. The rules state that "Banders working on licenced projects under proper permits may count, for their personal lists, the birds that they band, without the restrictions described in sections i and ii." DREW IS RIGHT I AM A COMPLETE IDIOT. Thanks, Drew. Okay, so there's a place nearby that technically own ring-necked pheasant. However, the birds are allowed to roam free, and can be seen just about anywhere within a mile or so of their 'home'. Would these be countable, since they are an established exotic, or no because their technically not 'wild' (just free-range)? Great question, Anonymous, but nope these pheasant aren't countable. Free range birds aren't actually wild, especially if they're regularly fed by humans which it sounds like these birds might. Plus, a once-domestic bird must establish a wild breeding colony for 20 years before it can be considered for countability. There are lots of countable populations of RN pheasants out there, but not these. Technically this is a flow chart and not a spreadsheet but KUDOS! Where can I get a copy for my wall? ?